The holidays are all about family and spending quality time together. Typically when I am home with my family, my mom and I are usually figuring out what to cook or bake while watching Christmas movies on Hallmark. This year is a little different, I spent Christmas with my boyfriend’s family in Georgia. I didn’t plan on baking while I was down here but after being asked I jumped at the opportunity to create something for everyone to enjoy. Since his sister’s family is vegan, I knew that I could not use any eggs. I was a little nervous because I do not have much experience with baking vegan goodies. After doing some research, I decided to make a bundt cake. I found an Orange Cranberry Cake by Tutti Dolci and decided to adapt it to make a Lemon Cranberry one instead. Her recipe calls for regular flour but I prefer to use cake flour in my recipes because I find that cake flour creates more light and airy cakes. To make the cake vegan, I removed the eggs, butter and milk and used different substitutes in their place. A great substitute for eggs is flax seed egg or simply using Neat Egg. For egg white substitute you can use aquafaba, which is the water from a can of chick peas (garbanzo beans) if you do not have chick peas, you can use any canned bean water. I’m sure you just read that and said to yourself, “What did she just say?” But trust me, it might sound weird but it mimics the properties of egg whites. It does not leave a bean taste at all, or else I would not use it let alone tell you all to use it. I would recommend greasing your bundt pan thoroughly to ensure that all the grooves are well greased. I went ahead and made a non vegan option as well, which is pictured below. ( Did not photograph vegan option. It was devoured immediately!) Another thing I added was turmeric for some added yellow color, this step is totally optional. I will insert the instructions for vegan and non vegan recipes. I made a simple glaze out of powdered sugar and lemon juice for one of the cakes and simply dusted the second cake with powdered sugar. This cake is very simple and easy to make and so good, it is super moist, light and fluffy. The adults loved it and the kids ate it up and asked for seconds; it is not too sweet so no feeling guilty for indulging. This cake will go great on your holiday table and your guests will be begging for more. Hope you all enjoy making this! 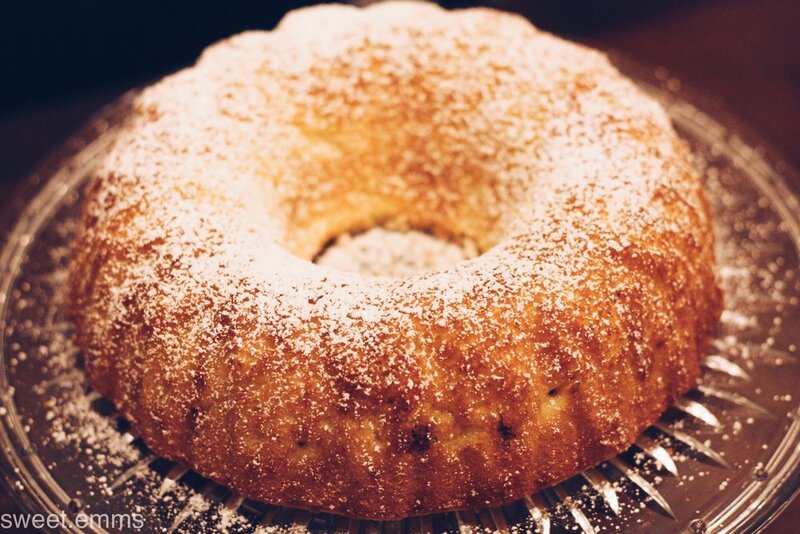 The easiest and simple lemon cranberry bundt cake. Super moist, light and airy, sweet, tart and perfect lemon flavor. In a mixing bowl cream together lemon zest, sugar and butter together until creamy; about 3-4 mins. Add eggs one at a time and mix on low speed for about 2 mins or until batter is smooth. In one bowl, mix together all the dry ingredients and set aside. (turmeric is optional) In another bowl whisk milk and lemon juice together and add vanilla extract. Add a part of the dry ingredients to your mixing bowl and mix together, add half of the milk and mix. Alternate adding the dry and wet ingredients ending with the dry ingredients. Be sure not to over mix ingredients. You don't want a chewy cake. Gently fold in cranberries with a spatula. Pour batter into pan evenly and tap the pan on the counter to make sure that there are no bubbles. Smooth the batter in the pan before placing it in the oven. Bake for 45-50 mins or until toothpick comes out clean. As the cake is baking, make the glaze. Simply mix powdered sugar, lemon juice and vanilla extract and whisk every thing together until it becomes a smooth consistency. Take the cake out of the oven and allow it to cool for 20-30 mins before flipping it unto a plate. Once it has cooled, you can either glaze it or dust the cake with powdered sugar. Store leftovers in an airtight container at room temperature. Substitute for step 2 in original recipe. In a small bowl, mix neat egg and water together to make your egg substitute. Add your "eggs" to the butter and sugar mixture and mix on low speed then add aquafaba 2 tbsp at a time and mix all together until batter is smooth.